I recently questioned the Taoiseach on the need for better public transport for the greater Dublin area. Currently the car parks at the Sallins and Naas station are averaging 165% to 175% capacity and other stations in the area experience similar problems. With the car parks operating so far over capacity, anyone arriving past 7.30 a.m. would have no chance at a space. I have been advised by Irish Rail that they would gladly expand the car park, provided the Minister for Transport, Tourism and Sport allow funding. With this, I requested the Taoiseach to ask the Minister to examine the issue. 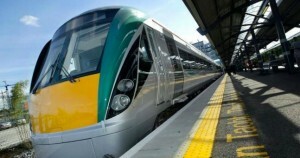 In response to my question the Taoiseach agreed that passenger numbers on the train have now exceeded the levels of before the financial crisis yet there has been no action to improve the lines. The Taoiseach indicated that this matter will be considered as a part of a 10 year investment plan that the government intends to publish in the coming weeks. The plan seeks to upgrade train lines significantly through additional carriages, electrification and car parks.